Wow – this was the chance of a lifetime! GIFS students went to Samcheonpo in Sacheon this morning to see the Olympic Torch! The Black Eagles Air Force Aerobatic Team flew over, and there were many traditional performances. Plus, we met the Mayor! It was so fun to celebrate Sacheon and Pyeongchang! Our story is in the Newspapers! 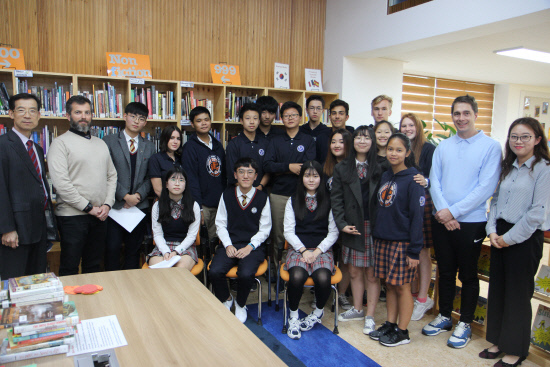 Samcheonpo Jungang High School (Principal Jeong Sun Chul) and Gyeongnam International Foreign School (GIFS) (Principal Charles Campbell) have begun a “Phone Conversation Program” with their high school students. The benefits of this program will be that the students from Jungang High School will be able to improve their English speaking skills, while the GIFS students will have an opportunity to broaden their understanding of Korean culture through this program. To start off, the students from the two schools exchanged contact numbers. They will start texting and calling each other soon. They are also planning to attend each other’s school events and have friendly sports matches. This program was organized through the efforts of the GIFS IB CAS Coordinator Glen Monaghan.